The Indian Air Force is prepared to fight a "short and swift war" at a short notice, Air Chief Marshal BS Dhanoa said today. "The nature of conflict in the present geo-political environment may require us to fight a short and swift war for which we need to be alert and prepared to fight on a short notice," he said, speaking at the 85th Air Force Day. The Air Chief's remarks come three days after he said that the Indian Air Force has the capability of striking across the border but adding that any decision on a surgical strike would be taken by the government. 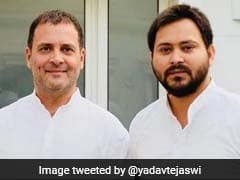 He also asserted that India is prepared to effectively counter any threat from China while confronting a two-front war also involving Pakistan. The remarks drew attention amid China's muscle flexing in the Dokalam Plateau and continued cross-border terror activities by Pakistan in Jammu and Kashmir. The Air Force was acquiring multi-spectrum strategic capabilities and remained committed to building a "joint manship" with the Indian Army and the Navy, Air Chief Marshal Dhanoa said today, in the presence of Army Chief Gen Bipin Rawat. 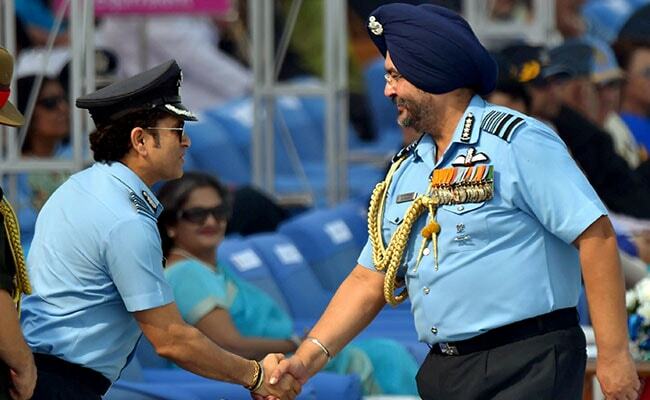 Air Force Chief BS Dhanoa greets Sachin Tendulkar, Captain of IAF. Earlier this week, the Air Chief, while saying that the force needed "42 squadrons to carry out full spectrum operations" but maintained that it was "ready for full spectrum operation" and "fight a two-front scenario". "There is a Plan B," he had said. "I assure my countrymen that these men and women under my command are confident to take on any threat and fully prepared to undertake full spectrum of air operation and respond to any challenge in the most befitting manner," he said today. 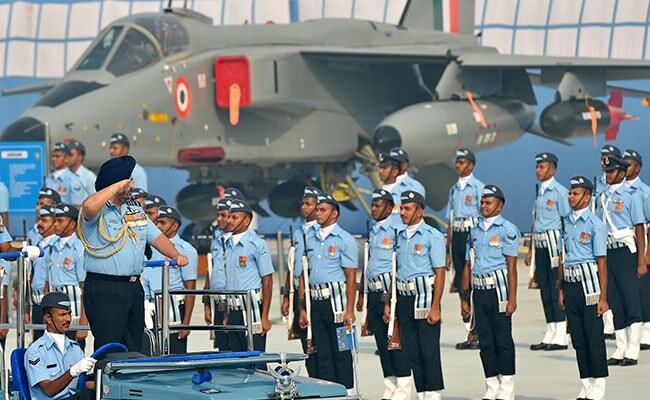 Air Chief Marshal Dhanoa also said that security at all Air Force stations has been strengthened to combat any threat, including sub-conventional threats, following the terror attack on the Pathankot air base in January last year. Heavily-armed terrorists from Pakistan had hijacked a police car and entered the highly secure Air Force base in Punjab, killing seven security men before being shot dead in an 80-hour operation. In his address, the Air Force chief also talked about the death of seven security personnel in the chopper crash in Arunachal Pradesh's Tawang on Friday. "Notwithstanding the high intensity of our flying, we cannot afford to have accidents and lose valuable lives and assets. Our losses during peace time are a cause of concern and we are making concerted efforts to prevent accidents and preserve our assets," he said.